With decades of experience in designing and manufacturing the best and most cost effective processing systems for each of our clients’ applications, we have applied this experience, during the past several years, to provide the hemp industry with the best hemp processing systems. We design, manufacture and integrate hemp processing systems for biomass drying and size reduction, ethanol, butane or super critical CO2 batch and continuous extraction systems, ethanol (or isopropyl alcohol) falling film solvent recovery, decarboxylation, and single, two, three or four stage continuous molecular distillation systems. The capacities of our systems are available from small stainless steel industrial systems sized for cannabis production through the larger size systems necessary for industrial hemp scale processing through 25 tons per day of hemp biomass per process line. These pages are dedicated to provide information regarding an introduction to the technologies and systems which we provide. Hemp drying and size reduction systems are based on taking the raw hemp biomass, drying to lower the moisture level to less than 2% and in controlled stages, reducing the biomass to the appropriate size for extraction. Receive raw hemp materials and then dry as appropriate with a belt dryer or paddle dryer if terpenes are to be collected during the hemp drying process. Cryo grinder. For the final size reduction step, the fine grinder is equipped with a Pulsed Jet Cloth Filter for dust collection. If appropriate, the materials go to a pelleting machine for granulation. Transfer the materials to storage and weighing or directly to the continuous hemp processing system. Ethanol Extraction Systems are manufactured and implemented in one of two operational choices: batch with centrifugal, static, or dynamic chambers or fully continuous counter current systems including decanting centrifugation. Systems to extract from 1,000 pounds per day biomass on through to 25 tons per day of biomass extraction are available to match the client operations in either single or redundent lines depending on client operational strategic choices. Our systems include everything that is necessary from the alcohol metering tank, feed pump, extractor (batch or fully continuous), discharge pump, storage tank for extract liquid, heat exchangers, connecting piping and valves, cooling utilities and PLC controls. Operational temperature is dependent on client goals from ambient to -70 degrees C.
Solvent Recovery Systems are implemented to remove the ethanol (or isopropanol) from the extract usually incorporating our falling film evaporators. Mass balance of the feed to this processing step is typically 5% or less extract requiring two processing steps, the first, falling film evaporation, to remove the majority of the solvent from the extract in a single pass with a very short residence time under vacuum and the second stage to complete the drying of the extract to ready it for decarboxylation using a pot still operating under vacuum conditions which is slowly agitated with a teflon tipped anchor impellar. 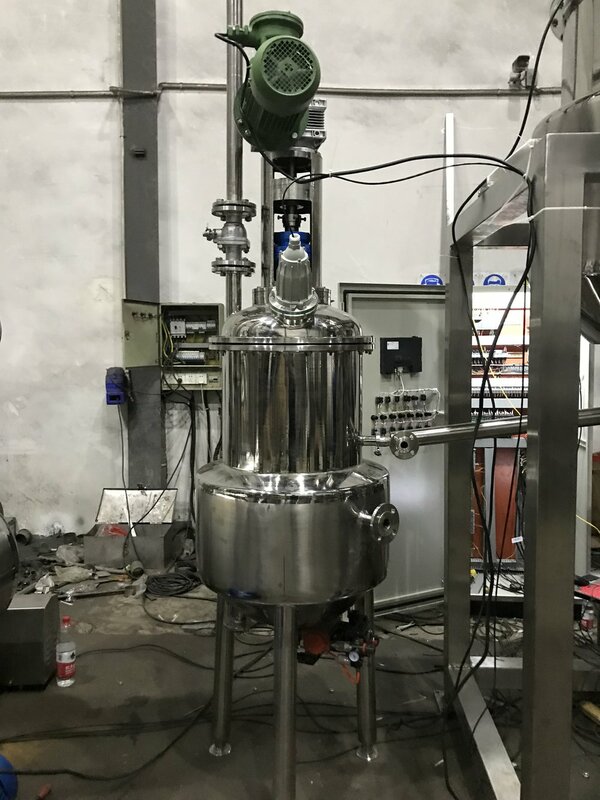 These systems are custom built to match the solvent evaporation rate necessary coming from the extraction system and include hourly ethanol evaporation rates of 50Kg/h, 100Kg/h, 200Kg/h, 400Kg/h, 800Kg/h, 1000Kg/h, 2000Kg/h, 5000Kg/h or larger systems in either single or redundent process lines. Decarboxylation Systems are built to take the dried extract oil from the solvent recovery system and hold at an elevated temperature long enough to decarboxylate the extract. These specially designed SS316L vessels are jacketed for the use of hot oil to heat the contents and have special anchor impellers with teflon tips to slowly agitated the extract and discharge completely after decarboxylation. Distillation Systems are implemented in single, dual, triple or four stage systems and can be equipped with preflash stages as the extract enters the first wiped film evaporation stage. Scale of systems are built to process 5, 10, 25, 100, 500Kg/h and greater extract feed rates according to client requirements. 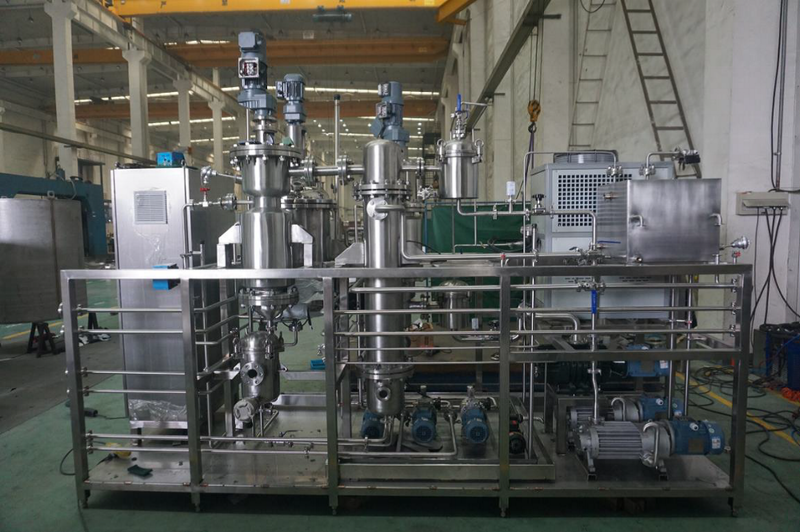 The first stage wiped film evaporators are equipped with single stage vacuum systems while the molecular still stages have multiple vacuum system stages to attain the deep vacuum levels necessary to achieve the final purity levels necessary for crystallization. Our piping systems and gear pumps are designed specifically for the hemp distillation requirements of low hold up and slightly elevated temperatures for maintaining good flow. Our well instrumented systems are controlled by Siemens PLC’s for SOP automation. Over a number of years and in concert with a variety of clients each with their own specific requirements, we have developed a variety of different processing technologies specific to the hemp industry. Our first goal is to determine with our client which of the many processes to apply to match their process goals and then to implement the appropriate solutions.